A typical Chanukah menu sounds as though it were planned by the under twelve crowd— potato pancakes, fried, of course, in lots of oil. Sweet cream cheese rugelach. Strawberry-jam-filled doughnuts (sufganiyot), covered in powdered sugar. Fried apple fritters. Cheese-filled doughnuts fried in oil and dipped in honey. Cheese blintzes. Is it all just a ploy to keep kids lingering around the candles and enjoying a family meal? Why do Jews eat fried foods during Chanukah? Most of us are familiar with the miracle of the oil— that one day's supply of oil lasted for eight days. And we know this is the origin of the mitzvah to light the menorah for eight days. It is also the reason why we have the custom of eating foods cooked in oil. There are deeper connections between olive oil and Chanukah. Mystically, both the menorah and the oil used to light it are associated with Chochmah, wisdom. The war between the Greeks and the Jews was also a war over whose wisdom would endure. The Greeks wanted everyone under their rule to think and study exactly as they did. They were violently opposed to the idea of G‑dly wisdom, and so forbade the study of Torah. Also, the word shemen, Hebrew for oil, contains the same letters as shemoneh, eight, the number of days that the miracle of the oil lasted. What is the connection between dairy foods and Chanukah? Yehudis was a young woman who lived in Bethulia, in the land of Judea, at the time of the war against the Greeks. She caused a Greek general to fall asleep by feeding him salty cheeses so that he would become extremely thirsty and then giving him wine to drink. Once he was asleep, she killed him. Upon finding that their general had been killed, the Greek army fell into disarray and fled. In memory of Yehudis's bravery, we eat dairy products as well. Nothing happens by chance—so it is really no surprise that two miraculous events of Chanukah came about through two foods whose rich symbolism recall many of the things we were fighting for as well. So now I get the basic connection between fried and dairy foods, and Chanukah. But where did all the different traditional Chanukah foods come from? Over the centuries, different Jewish communities throughout the world have found a variety of ways to incorporate both oil and dairy into their Chanukah meals. 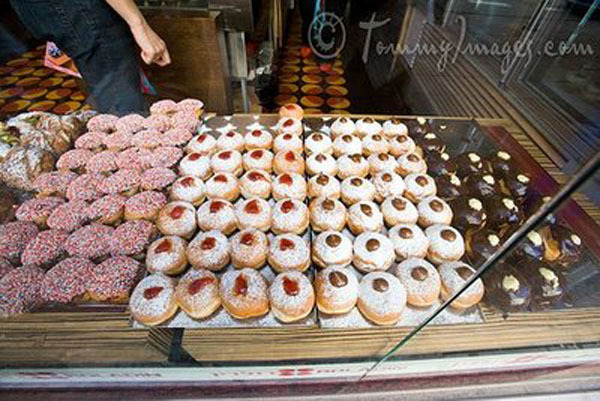 One of the most famous, Israeli sufganiyot, may actually derive from a yeast dough pastry mentioned in the Talmud. These pastries were cooked in oil and called sufganin (absorbent) because they absorbed a lot of oil in cooking. They did not contain milk, but were sweetened and perhaps even filled with honey and the fact that they were cooked in oil led to the pastries becoming a Chanukah staple early on. In Spain, Jews added cheese to these pastries—and from this twist on an old tradition evolved the many cheese doughnuts, fritters, and other fried cheese pastries popular among Sephardim. They may have influenced the cheese pastries popular in some Central European communities as well. A jelly-filled version evolved among German Jews, who brought it with them to the Land of Israel in the 1930's. 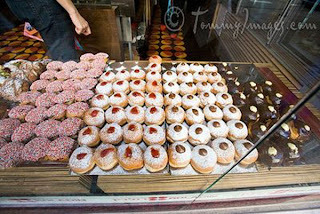 In India, the sweet yeast dough remained primarily a flour and honey or sugar combination, but milk and butter were added as well, making the Indian version of sufganiyot also a dairy treat. In more Northern communities, where olive oil was scarce and expensive, goose or chicken fat often had to be used for frying. Potato latkes, apple fritters, and other non-dairy fried foods became the norm, although today when olive (or other pareve) oil is affordable and commonly used in preparing latkes, etc., dairy is often added—usually in the form of a dollop of sour cream on top of a latke. A very interesting post. Thank you for sharing with us. Thank you for a most educational post. Also it all sounds so yummy.